The leaderless online activists deface Fine Gael’s controversial new website, advising users that the party ‘censors their voice’. Visitors to www.finegael2011.com were this evening presented with this message, posted by members of the Anonymous collective. FINE GAEL’S NEW WEBSITE was last night defaced by the anonymous hacker group ‘Anonymous’, which replaced the party’s new ‘tell us what you think’ campaign with a holding page telling visitors that the party was censoring submissions. Nothing is safe, you put your faith in this political party and they take no measures to protect you. They offer you free speech yet they censor your voice. Furthermore, the page’s title changed to read: ‘The problem with politicians is they lie’ – a play on the party’s own message, that politicians talk too much and listen too little. The malicious code was housed on a server in Samoa, under a domain registered anonymously. The Anonymous group is more widely known for its occasional campaigns against Scientology, and more recently for orchestrating attacks on the websites of companies that had withdrawn funding services to the whistleblowing website WikiLeaks. The site has now been removed altogether; visitors now are instead presented with a holding page which indicates that the site’s webmasters have temporarily deactivated the site entirely. On Monday afternoon the party confirmed that the details of 2,000 of its users had been compromised by the attack. Fine Gael’s ‘traditional’ site, which had remained active at finegael.org, also remains offline at the time of writing; this also appears to have been a reactive move from within the party itself. On Friday TheJournal.ie reported that the new website was based on servers in Miami, meaning that none of the Dáil’s political parties had their main websites based within Ireland. The site’s US-based hosting had also raised concerns within the blogosphere about the party’s compliance with the Data Protection Acts, and whether their transfer of personal data to a host outside of the EU was being done on a compliant legal basis. The website was amended later in the week, allowing users to opt-out of party communications. 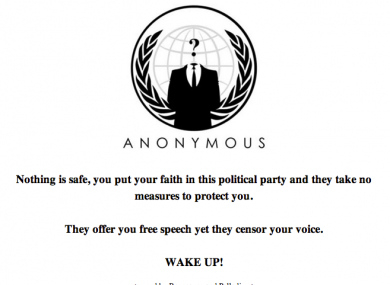 Email “Fine Gael website defaced by Anonymous 'hacktivists'”. Feedback on “Fine Gael website defaced by Anonymous 'hacktivists'”.